I shouldn't have made these cookies... these perfectly shaped, tender, melt in your mouth, highly coveted, classic irresistible Peanut Butter cookies. A request from a neighbor had me flipping to the well used page in Nancy Baggett's All American Cookie Book with the book actually falling open to the correct peanut butter smudged page due to the worn crack in the binding. Seeking the classic crisscross Peanut Butter Cookie for as long as I can remember, the treat is obviously a favorite. Growing up, my German grandmother made them every time I visited her in Minnesota and I actually argued with my cousin over who she had made them. He swore that she made them special for him as he was the favored male grandchild, but I had a feeling that she really made them for me as they were always there when I was, and she would smile as she handed me a plate while saying, "I know you like these." Therefore, I know they were for me! 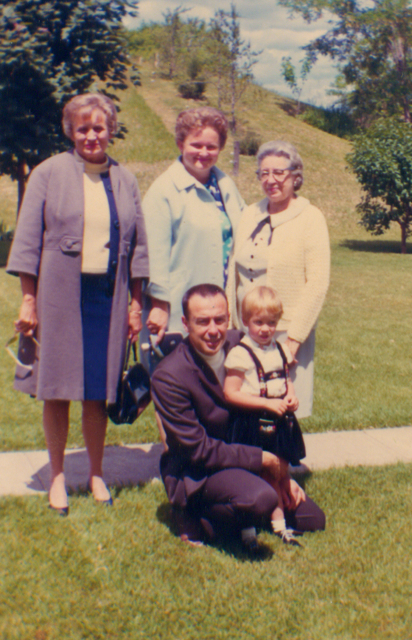 (Grandma is on the far right in the photo here from 1969, my dad is holding me and mom is standing in the middle) I wish I had asked for her recipe, but Nancy has come to the rescue with her version (which is so similar to Grandma's that it could be the same!). Even puppies love the cookies! Tavo, our 1 year old Maltese, lends a "hand" with my photo shoot. I did pass half to the neighbors, but the healthy-sized batch makes enough that half left us with over 20 cookies! And... they just keep looking at me every time I walk by. I only have one. But alas, one cookie 5 times a day is not working with my renewed gym workout. I do find solace in the fact that I adapted them to be ever so slightly healthier by leaving out the 3 Tbs. of oil and in addition, my guilt is lessened even more by the realization that Peanut Butter is indeed a healthy source of protein as well as a source of potassium, vitamin E and other minerals. So... I guess that while they are not really "health food", they are certainly giving me a few important minerals as they improve my day. Thanks Nancy!! Edited 1/21/11: Just received an email from my Dad saying that he thinks that Grandma (his mom) made the cookies for him and my cousin and I just happened to be there!! Nancy's book is my "go to" book when looking for a cookie recipe. This recipe being one of my all time favorites. I have altered it a tad over the years reducing the butter slightly and increasing the peanut butter (mostly by accident one day when I was short of butter!) and on occasion I sub a little bit of spelt flour in place of some of the a/p flour (maybe 1/2 cup or so). Nancy also adds 3 Tbs of oil to butter and sugar, but I have omitted that. Preheat oven to 350º. Spray baking sheets with cooking spray or line with a silicone mat. In a large bowl whisk together the flour, baking soda and salt, set aside. In a stand mixer (or with an electric mixer) beat together the brown sugar, sugar, and butter until light and fluffy. Add the eggs and vanilla and beat until evenly incorporated. Beat in the peanut butter and then gradually stir or slowly beat in the flour mixture until evenly incorporated. Refrigerate the dough for 15 minutes or until firmed slightly. Shape portions of the dough into golf ball-sized balls with lightly greased hands. Place on the baking sheets about 3 inches apart. Place about 1/4 cup of sugar in a small shallow bowl. Lightly oil the tines of a fork and dip the tines into the sugar. Using the fork tines, firmly press down each ball horizontally and then vertically until the ball is flattened to about 1/2 inch thick. Dip the fork into the sugar and press the same design into each cookie to flatten. Bake for 9 - 12 minutes or until tinged brown at the edges and just beginning to firm up in the centers, being careful not to overbake. Reverse the baking sheets halfway through the baking to ensure even browning. Remove from oven and allow to cool on the baking sheet of 3 - 4 minutes, then transfer to a wire rack to cool. Our batch made about 40 irresistible cookies. Ok - this is serendipitous (is that a word). Anyway, I was just talking about my Mom's love of all things peanut butter. These cookies look so good. I will definitely be making these for you. And I LOVE the photo with your puppy in it! Your cookies look so good, and I like anything peanut butter. We use the natural peanut butter that is just peanuts and salt. The oil does rise to the top, so you have to keep it in the fridge, and sir it, but it's so much better than Skippy or Jif. Oh wow, look at those! I love peanut butter cookies, these look so delicious. The picture of your puppy lending a "hand" is adorable! Peanut butter cookies are my all-time favorite! Love this recipe, love your photos! lovely, lovely cookies! i loved the shot of cookies with the puppy- really cute! Your cookies look yummy, but I really had to comment on your cutie pie pup. Kisses for Tavo!!!! 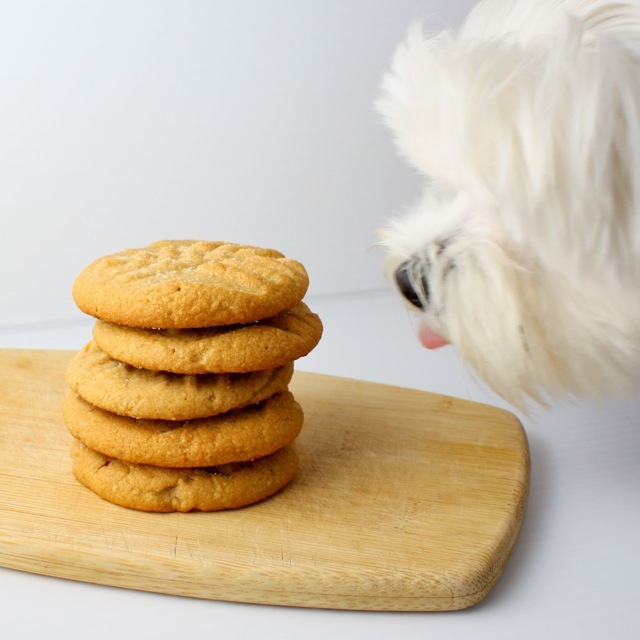 Love the picture of your dog checking out the cookies. What perfect-looking pb cookies. I haven't made peanut butter cookies in ages!! These look great! Love the puppy assistant...or was puppy actually in charge? PB cookies are my Mom's favorite...I'll have to bake her some when I go home next. These look so good, Kim!! These look so very good. I love a good peanut butter cookie!I really like your blog! peanut butter cookies are my weakness and I can't make them very often because I'll eat the entire pan. I do enjoy peanut butter sandwiches so i don't see any reason why i won't like these peanutty treats. Awesome pictures too! They look perfect! Love the story about your grandma! I hope to epic like that one day :) In the photo, are you wearing little lederhosen? So cute! Also love the dog photo! I think you're right, they do have a lot of nutritional benefits! Actually they should be considered part of a balanced diet considering all the nutrients they provide :-D But seriously, I was just looking for a new peanut butter cookie to try today, so this is great, thanks. I love the pic with your dog--priceless! So funny, too--my uncle calls these "fork cookies." Very nice job! These sure look irresistible! My husband loves, loves peanut butter cookies. Maybe I should be nice and make him some:)The picture of your pooch.....love it! btw, your pictures are getting better and better everyday. the puppy/cookie pic is fantastic. I like cookie recipes in January especially peanut butter cookies that look as good as yours, yum! I have Nancy Baggett's All American Cookie Book and I think the recipes all sound good, makes for a good read, and best of all, they work! 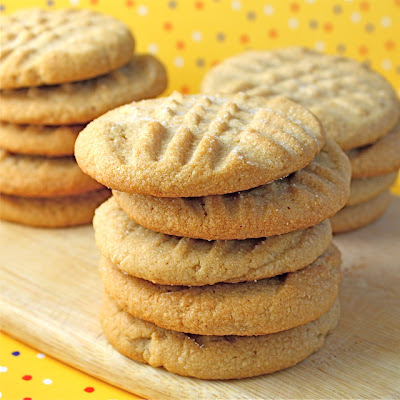 I haven't had classic peanut butter cookies since I was a kid, I forgot how delicious they were til I saw these pictures! I will have to make these for my family! Thanks! OOOOH there is nothing left to say, except.. ohh yum.The picture of the cookie and the dog are priceless! I loveee peanut butter but surprisingly never baked with them!!! These cookies look and sound sensational, I must try this recipe soon!! These look like such yummy cookies. I love the story behind them, as well as your edit about your dad. It just goes to show how many memories food can invoke. Your cookies look completely perfect, from the criss-cross on the top to the fluffy thickness. I love the photo with the dog. What a help!?! I love the classic cookie! ... And stories about grandmothers!!!! These look like the ones my mom makes. I love a good classic peanut butter cookie. Tavo is adorable! PB cookies are my all-time favorite! And I love the criss-cross on yours...They look so perfect, not to mention chewy and delicious. YUM! Peanut butter cookies are big huge favorite of mine. I saw this post when you first published it and I had every intention of making these while we had family in town but there was not enough time or enough days to fit in any more treats! Pasta e Fagioli.... sort of!